The Ambassador Roundtable is a once a year all-expenses paid experience allowing better than the best Margaritaville ambassadors to come together and not only celebrate their success, but make a difference in the future of the Margaritaville brand. The Inaugural 2017 and subsequent 2018 Roundtables were hosted at the Margaritaville Hollywood Beach Resort in Florida. During this time, fifteen college students had the opportunity to share their feedback, ideas, advise and marketing knowledge with the Margaritaville team. The first roundtable was even covered by Vice, with the buzz only growing from there. What happens at the Roundtable? Besides plenty of free time relaxing in cabanas, walking on the beach and paddleboarding the intercoastal, the crew tours the resort and enjoys many or all of the Margaritaville food & beverage concepts on property, including an evening in the private room at JWB Steak & Seafood. Sometimes a few VIPs drop in to pick the brains of the college ambassadors, share new ideas or just say hello. In between it all, we host a group competition for the annual Fins Up Cup, which has become a highly sought after prize, for bragging rights alone. We can’t give away all the details, but we strive to make this a once-in-a-lifetime experience for the top performers in the College Ambassador Program. It’s not all palm trees and sunshine... There are dozens of people who work behind the scenes to help turn this occasion into reality, and we extend a big thank you and Fins Up to all of them! "Step out of the dorm room, get creative, it’s amazing where imagination will take you." - Alex H.
"Don’t be afraid to dream big and hear 'no' every once in a while." - Danielle B. "Be creative, be involved and engaged, have a Fins Up attitude, channel your inner Buffett, and know a 'no' is really just a 'maybe'!" -Lauren K.
"Work genuinely hard, bring out your creative side and have as much fun as you can. I promise it will be worth it." - Katie G.
"Find your own path to success, and remember the people you meet along the way." 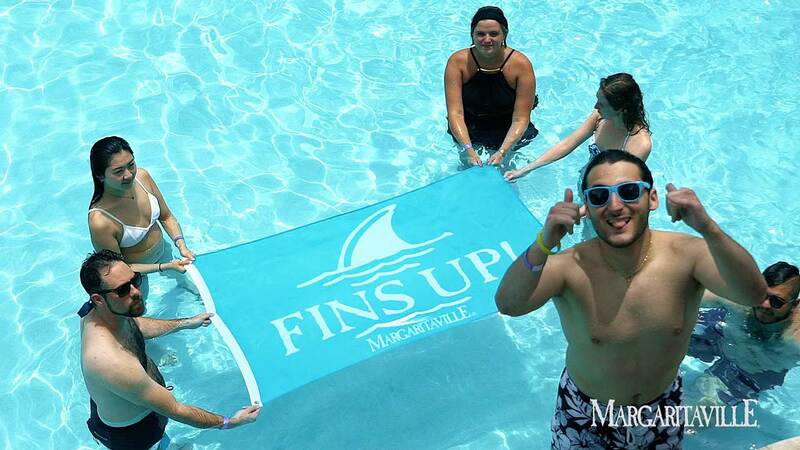 -Adam S.
"Have fun, put yourself out there, and keep your Fins Up everywhere on campus!" - Isabelle R.
"Margaritaville inspires community; embody the brand and you will also inspire community.” - Christian W.